To load a image from the server, local or remote depending if you are developing locally. I have been using monodevelop with the moonlight addin, this allows you to create silverlight applications with Linux :). 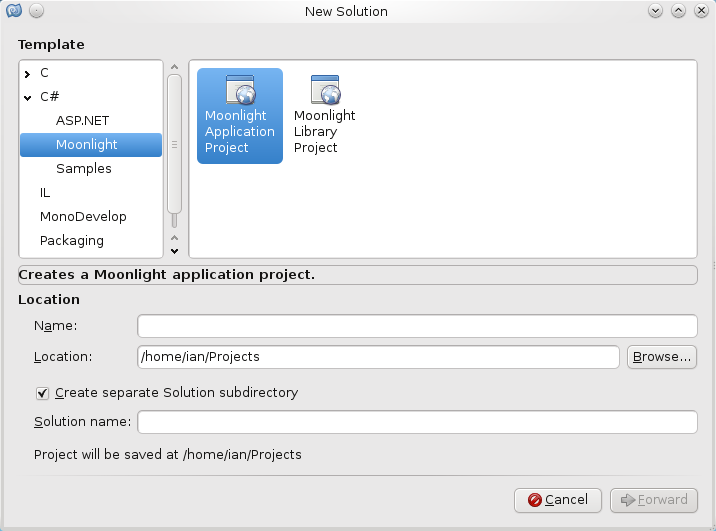 To start with, if you create a new solution by going to File->New->Solution and then selecting the moonlight Application project as similar to creating any other new project within monodeveloper (or within visual studio if you are using visual studio to create this silver light loading images on the fly). And then within your main page.xaml file you need to define where you want the image to be placed. above also includes the Button that you are going to click onto to load the image, in this case it will call the ButtonClick function (from the above it is the “click” method). The ButtonClick is behind the page.xaml within the page.xaml.cs file (the csharp file). I put a little message pop up window to say “hi there”, just so that you know it have been clicked encase the lcd.png (as taken from the open clip art website here) is not in the correct place, in this case it is placed within the bin/debug, but if you are using a release edition or using visual studio you may have somewhere else. I have included the full source code and image within a zip file above, please feel free to download. Here is the full page.xaml if you want to look over it. and here is the full page.xaml.cs file. As from the web service server from the previous post you can now link to that web service. You will need to do a couple of things to be able to get the client to “talk” to the web service. the /t:library means to create a .dll file, if you do not pass in the “-r:System.Web.Services” it will complain with the below error. 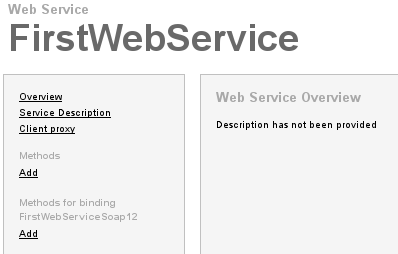 FirstWebService.cs(21,51): error CS0234: The type or namespace name `Services' does not exist in the namespace `System.Web'. Are you missing an assembly reference? that is about it, of course it is nicer to have a web page to post some values to the server from the client, so here is the client source code, if you save this as web_service_consumer.aspx (aspx is a web page extension) and then just goto that web page hosted on the apache environment. The type or namespace name `FirstWebService' could not be found. Are you missing a using directive or an assembly reference? that is because you have not created the bin directory and placed the FirstWebService.dll into that directory as describe at the top of this page. 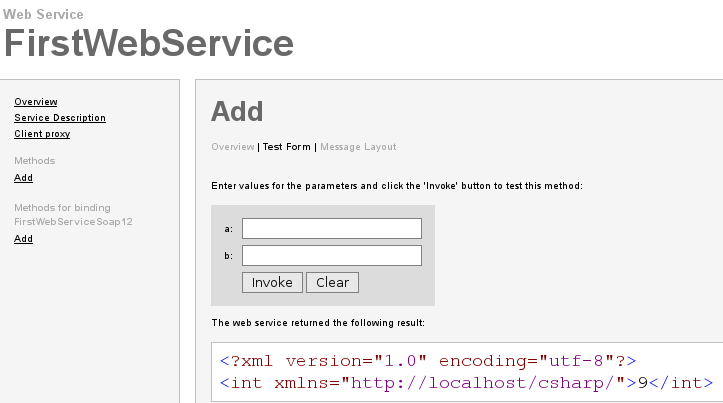 An web service is basically like a SOAP server in that it “talks” from the client-server in XML with the client requesting the function on the server and obtaining a result. I am using mono to compile and run the web service since I am running apache on Linux (kubuntu) (here is how I setup the mono apache module within k/ubuntu). To start with, you need to create a web service instance and what language you are going to be using (since using mono then c#) and also the class that you want to “expose” to the web service itself. and then just within the class structure you only need to tell the function with a attribute heading of [WebMethod] that it is going to be “exposed” to the web service, if you do not put that in, it will be “exposed” to the web service and thus the client cannot access that method. and that is about it, the mono (and of course .net base framework) will create the rest of the WSDL and additional parts for a WebService. // but since it is part of the class you can still call class methods etc. An event will be fired when something has happened and then you can link to that event and do something else if you wanted to. To start of with you have to link a event with a delegate function which will be the event handler. // setup a delegate for the event to fire with. here is the class that will actual fire the event, to start with I link the “event” to a virtual method as such called Changed (with the delegate from above ChangedEventHander). // this is the MyEvent class that will create the event fired. here is the event firing function, this will call the Changed “virtual” method as such when ever you call this function. // make sure that there is something to call for the event to fire. and here is the get/set for the internal X variable and in the set I call the ThisHasChanged function above. // call the ThisHasChanged event when you set the internal value of X. So that is the event firing, but you will need to have a listener that will listen to any events and call something that will deal with the fired event, so here is the listener class. So the listener, is just like any other class, but you will need to have a internal reference to the class above so that you can link to the event fired, so here is the MyEvent internal class for the listener. and then the constructor for the EventListener, you pass in the MyEvent class that you want to “link” (the one that you will create within the running part of the program). and from within the MyEvent, there was a “virtual” method as such called “Changed”, well now we can create a link so that when that event “Changed” has been called from within the MyEvent Class I can link to a function within this class EventListener with using a new delegate ChangedEventHandler and the ValueHadChanged is within the EventListener class. // the class constructor and you need to pass the MyEvent class to link to the listener. // this is the link to the listern function. here is the ValueHadChange, same setup as the delegate parameters since we are basically passing event details between them both and can pass in more details is you want to, but you really only want to have the object (the MyEvent class) and any event arguments e.g. errors etc. at present it just says , “Oh yeah.. I have altered”. // same style as the delegate e.g. object, eventargs, that is sent from the event fired. // THIS IS THE LISTERN as such, function..if you want to do something like.. do not alter the value!! // take the event linked from the MyEvent class. // when alter a number in the internal part of the class. // should fire of a event !! because I am changing the internal x value. // will not fire a event because I have not changed it. // will fire of another event. If you want to gain access to the object sender within the EventListener class to the function that was listening to the event fired, if you alter it as below, but also since because the MyEvent was also linked within the constructor you also have that link as well. In Object oriented programming languages, there is a nice keyword that is “new” what this does is create a new instance of a object and run the objects constructor method and setup up the internal variables, for example. this will create a new instance of A with the constructor (same name as the class) setting x equal to 0. What is happening is that the variable “a” is pointing to a memory location of the newly created object on the memory heap for example. with the memory heap as such. since the Equals function is actually comparing the values within the class instance and not the a/a2 variable values (which point to memory locations). // places on the heap of storage, thus they are NOT the same..
// both have the same x value but different memory location values. since I am overriding the Equals from the base object class, the compiler may warn that I am not overriding the GetHaseCode(), but that is k for this example.